The statistic shows GDP per capita in the United Kingdom from 2012 to 2017, with projections up until 2022. In 2017, GDP per capita in the United Kingdom was at around 39,800.27 US dollars. The same year, the total UK population amounted to about 64.6 million people. The United Kingdom is among the leading countries in a world GDP ranking. GDP is a useful indicator when it comes to measuring the state of a nation’s economy. GDP is the market value of all final goods and services produced within a country in a given period of time, usually a year. GDP per capita equals exactly the GDI (gross domestic income) per capita and is not a measure of an individual’s personal income. 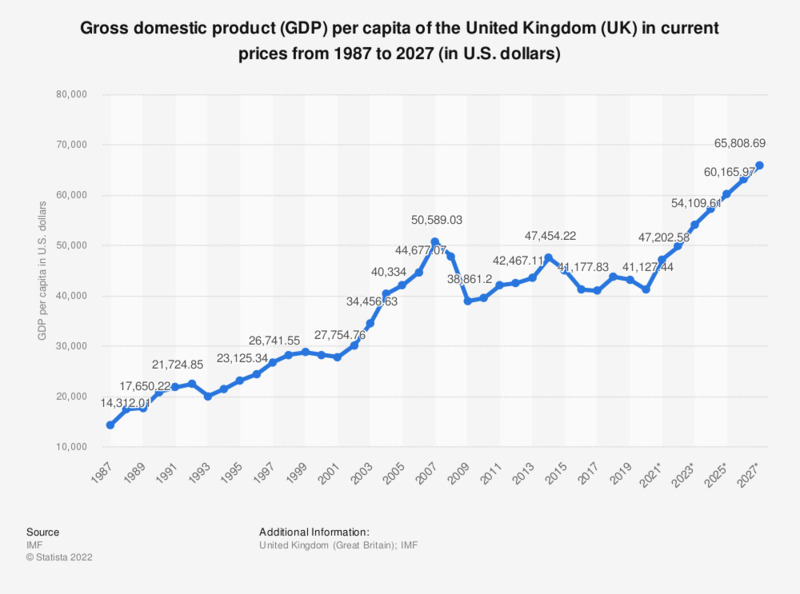 As can be seen clearly in the statistic, gross domestic product (GDP) per capita in the United Kingdom is beginning to increase, albeit not to pre-recession levels. The UK is beginning to see signs of an economic recovery, though as of yet it remains unclear what sort of recovery this is. Questions have been raised as to whether the growth being seen is the right sort of growth for a well balanced recovery across the necessary sectors. An interesting oddity occurred in the United Kingdom for nine months in 2012, which saw a decreasing unemployment occurring at the same time as dip in nationwide economic productivity. This seems like good - if not unusual - news, but could be indicative of people entering part-time employment. It could also suggest that labor productivity is falling, meaning that the UK would be less competitive as a nation. The figures continue to rise, however, with an increase in employment in the private sector. With the rate of inflation in the UK impacting everyone’s daily lives, it is becoming increasingly difficult for vulnerable groups to maintain a decent standard of living.